There are plenty of trails going to the top of Harishchandragad. A difficult beeline route, known as Nali chi vaat (नळी ची वाट) exists, which joins the Kokan Kada (कोकण कडा) a massive parabolic overhang cliff. There are multiple Nali chya waata and they all need fit people. Climbers have climbed the parabolic overhang (कोकण कडा) too. The trail of 'Junnar Darwaza' starts from Khireshwar. The most preferred route via Tolar Khind also starts from Khireshvar village, and later meets the route from Junnar Darwaza. Khubi phata (खुबी फाटा) is well connected by Public transport. Harishchandragad can also be accessed from opposite side- Pachnai (राजूर, अकोले) and also from लव्हाळे village. Belonging to 6th century, countable number of relics of the bygone age are still found here. At the base of the mountain, resides the Nageshwar (नागेश्वर) temple. There are carvings of different Hindu deity, right from the ceiling to the floor, which are pleasing to watch at. At the top of the mountain, 4700 ft. above sea level, lies yet another ancient temple- Harishchandreshwar (हरीश्चन्द्रेश्वर). Sounding the temple bell and listening to its clangor was, as usual, a divine experience. Behind the temple is the cave of Kedareshwar (केदारेश्वर) and the (supposed to be) origin of the river Mangal Ganga (मंगळ गंगा). Harishchandreshwar temple lies at the center, surrounded by different caves. I have created this short video based on adventure we had there. The snake in the video is a baby-python, and no, it wasn't harmed while filming the video. Enjoy the video. An Adventure-packed trek to Harishchandragad from Deovrat Phal on Vimeo. We boarded a Pune bound ST bus from Kalyan, at 6:35 AM, going via Manchar - Junnar, and got down at Khubi phata (खुबी फाटा). Khubi phata to Khireshwar village is a ~3 KM walk (also a good warm-up exercise). 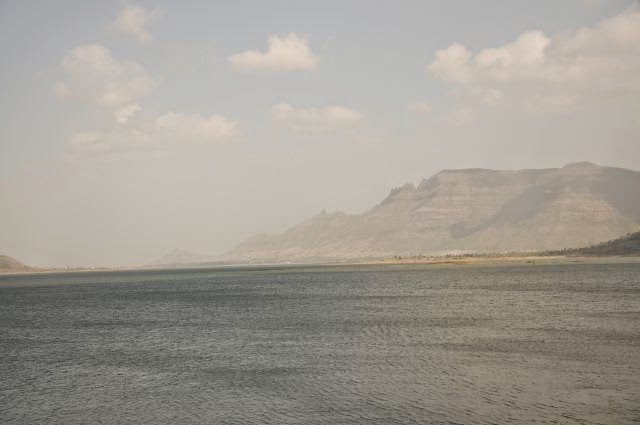 We climbed Harishchandragad via Tolar khind route, which is a traverse through the mountain. We visited the Taramati peak, Kokan kada but had to skip the citadel (बाले किल्ला) due to time constraints. On the next day, we had a swim in the Pimplagaon dam. Roughly around 4:30 PM we caught the ST bus to Kalyan, and reached Dadar station at 9.30 PM. Visiting kokan kada was top on our priority list. After having a light lunch we took the road to the cliff. The sky was partly-cloudy which means not suitable for experiencing the sunset. Whats so special about this kokan kada ? Well, there's a parabolic overhang beneath the cliff and when the wind blows inwards (towards the cliff), it gets an upward momentum. Throw a small tree branch- it falls few feet below and then rises with the wind to atleast 200 ft in the air above the cliff. Do experience this once in the lifetime. Try throwing water, the water droplets fly upwards!! Note: Please do not throw plastic bottles or any plastic waste. It becomes difficult to clean those. Its a bad scenario if the bizarre place like Kokan-kada is infested by plastic. It started getting darker by 6.30 PM and we headed to our caves (pretty nomadic eh!!!) With Maggi Noodles and Bhakri for dinner, we went to sleep in our cozy sleeping bags and mattresses. It was 3.45 AM in the morning. We (Ninad, Sumit, Aditya and me) stepped out of the cave. The sight was quite spooky. It was dark, the fog had engulfed the whole top and we couldn't even see beyond the the 3rd feet. Not to mention the bone-chilling cold !! By 5.30 AM everyone woke up and we started our trek to Taramati peak, the highest point of Harishchandragad. It was even more spookier at the top than we expected. the valley was covered in the clouds on both the sides, and we were walking on the ridge, not having a single clue about the depth of the valley. We encountered a few steep rock-climbs at some places which were exposed to the valley. But we couldn't see the valley in the first place and so no fear while climbing !! It wasn't raining, but the strong winds and the clouds felt as if it was. The experience was nostalgic. Only sad luck was that we were not going to experience the heavenly sunrise. From left: Nikhil Phatak, Ninad Vilankar, Aditya Gurav, Sumit Ghogale. The Mountain is hiding behind the thick mist ahead. There are jeeps available to reach Khireshvar, but they charge heavily. So we preferred walking. On the way. Almost half-way. The route from Junnar Darwaza meets somewhere near this small shanty. This is after the rock-patch. The remainants of fort walls can be seen here. After this, there is still a long way to go. The arrow-markings all along the route helps to trace the proper route. In this picture, is the सप्ततीर्थ पुष्करणी तलाव. This lake has 14 small temple like compartments (as seen in the pic). When my parents visited this place some decades ago, they had the 14 Lord Vishnu idols in them. Now these idols are shifted to different temples (Harishchandreshvar etc.). Although the lake looks in a bad shape, the locals said that there will be a cleaning mission soon happening here. Experiencing the divine "Kokan kada"
Now this is a big Shiv Linga right there. A tradition- go around the Shiv-Ling in the 4-feet waist-deep freezing cold water! Its very safe, but cold. There were four pillars holding the temple. Now the temple stands on the single pillar. The legend- the World ends when the fourth Pillar falls. And personally, I don't have a good reason (yet) as why I should not believe this old legend ! The water in this temple never dries out, not even in Summer ! The Junnar Darwaza route goes via this Nedha. This route is not frequented, but exists. It would be an adventurous journey to try this route. This is a very old temple full of carvings and sculptures from the ceiling to bottom. It houses the शेषशायी विष्णु sculpture. A Note: Harishchandragad is super crowded during weekends. It is changing its designation from a trek to 'picnic spot'. People ring the villagers to "book" a cave for them. You may also find tents near the caves. Beware, late night chaos in the caves is common now. If you are planning to go to Harishchandragad for peace, then aim for a weekday. If not, then I strongly recommend you to carry your own tent and sleeping bag, and camp somewhere else, away from that boisterous crowd. And if you don't have a tent, cave is the only option, and you find an empty cave, then take it! Its still first come first serve. Do speak to the locals, they might help you.